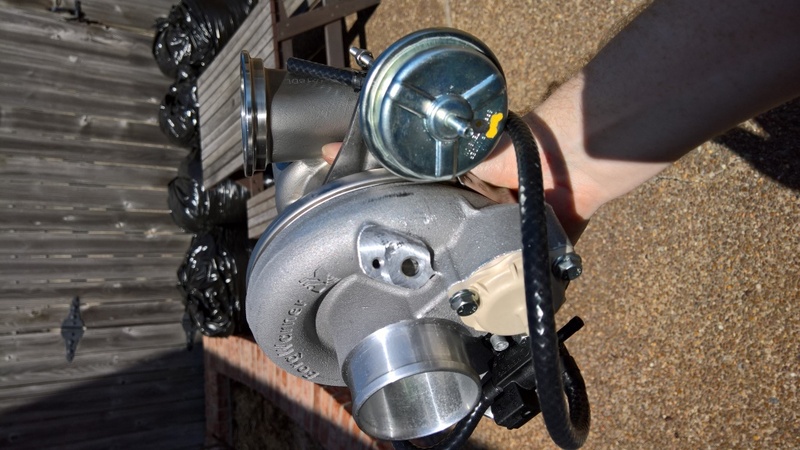 [NC] 7.5lbs per HP build thread / xpost from M.Net - Page 4 - Miata Turbo Forum - Boost cars, acquire cats. D'oh, prior dyno customer's car broke ON the dyno this morning. :( Staff was very apologetic, and offered 50% off my rescheduled runs. So, "dyno day" has been rescheduled to Friday, March 4th at 8:30am. 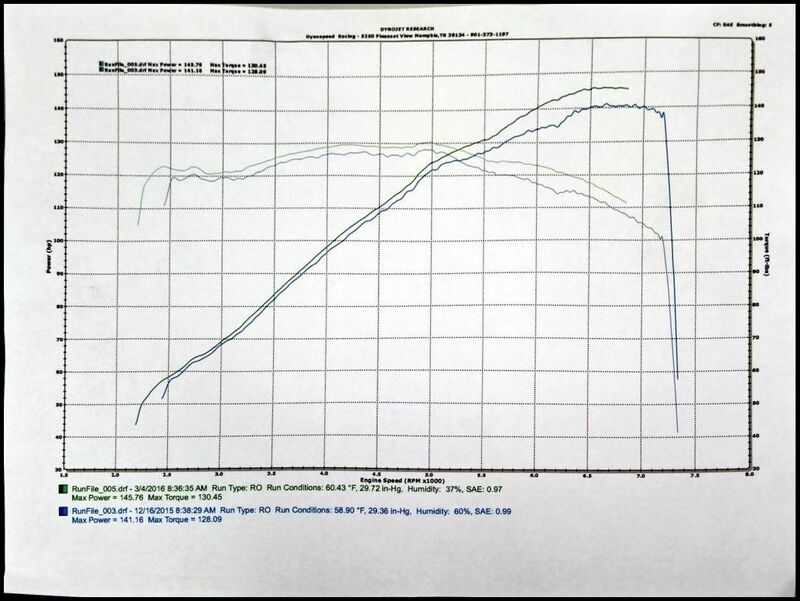 The two overlaid plots are my car's best (Run 3) in 100% stock configuration, and then the best (Run 5) in the same 100% stock config along with an ECU tune. The environmental stats were nearly identical with the exception of higher humidity back in the original stock run. Yup, four horsepower and two pounds of torque. The good news is I only paid half price for the session I'm not really sure what I expected, except for more. Still, this car dyno'd awfully high right out of the OEM box; maybe I got a ringer and there's only so much more a tune could do? The NC platform has a bit of power leg-up on the prior gens, but also has to drag around a bit more weight. Still, if I recall correctly, the NC straightline acceleration figures were basically equal to the MSM NB from the factory floor. 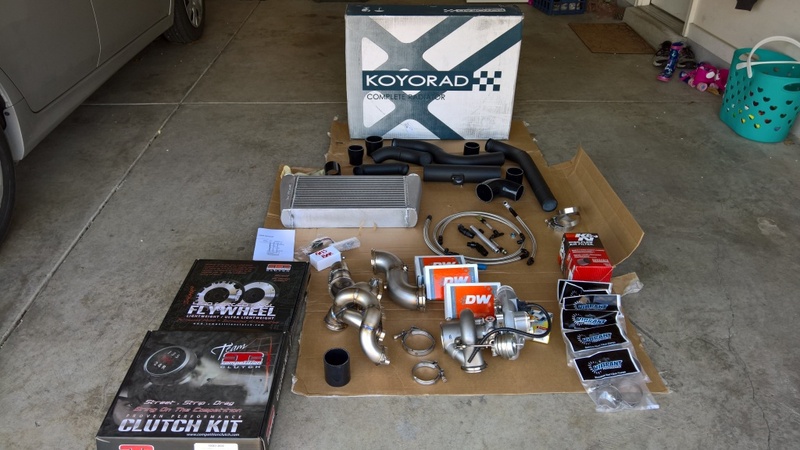 Eagerly awaiting install pics, and post-install dyno. What AR are you running on that 6758? It's the full vband setup, so 0.85a/r. You can only go smaller a/r with this frame if you use a T3 flange. Bryan also offers this kit with the smaller frame 6258, or the bigger 7163. Sorry if I am using your thread to wonder, but Savingtons kit for the NA/NB uses the T25 flange because that is the only current way to get the .64 a/r. He says he did that for the best response. Will the extra .2 liters of displacement with the NC engine compensate for the bigger a/r that the v-bands come with or is it forever doomed to be less responsive? You're welcome to use the thread to wonder, because I honestly can't say I have the answers yet either We're all gonna find out, because you bet your *** I'll be posting the dyno from 2krpm up! Last edited by albuquerquefx; 03-28-2016 at 09:45 AM. I think the small frames (B1?) use either a T25 .64 or a V-band .85. T3 should only come on the larger frames, unless they are offering even more options now. Just doing some quick math, my 2500lbs/330whp, puts me right at that 7.5hp/lb you're looking for. Let me tell you, it's an amazing feeling. Good luck with it! Ahh, yes I suppose the T25 makes far more sense than the T3. Shows you how much I know! Either way, only thing Bryan is offering is vband regardless of frame size. The 6258 offering was primarily a reaction to someone asking; he suggests it only for people who would be happy with a horsepower glass ceiling of low 300's on the factory NC 2L. Love the MSM by the way; I sorely miss my '04 Ti. I was living in SoCal when I bought it, so I bolted up a Forge valve and (CARB-approved!) AEM CAI and had a blast. That was my first turbo Miata experience, and I knew I needed moAR. The EFR 6258 can probably hit mid-300s on a 2.0L if I can get 330whp from a 1.9 (really a 1.84) on 20-21psi. Now, it's a great turbo and I'm sure the .85 will still be fantastic for the NC's 2.0, given all the other things this turbo has that others don't like that Ti-Gamma wheel. I personally can't help but think that the v-band only offering is more for keeping costs down (no $100+ hardware to use). Then again, you do have a 2.0 so maybe that .85 is more ideal for you. I don't really know, but you won't ever be sad with an EFR in your car. Yea, the extra displacement probably bridges the gap. I wonder if anyone has actually done a comparison between the .64 and .85. 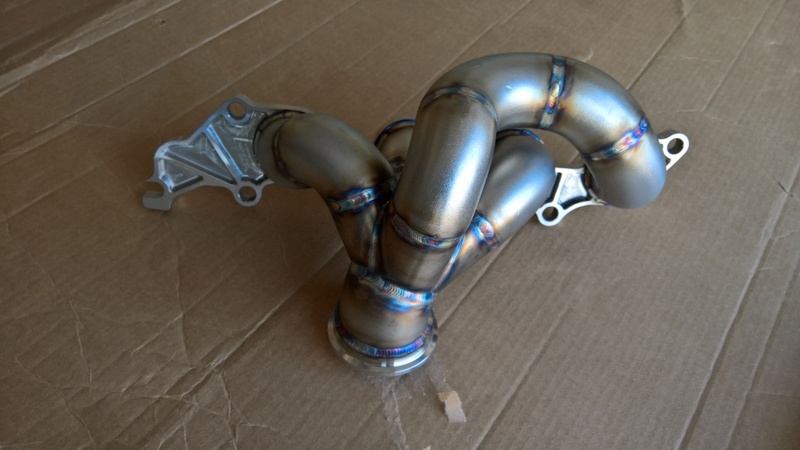 I dunno, if I wanted bigger, I'd just get a 6758, but I already have a T25 manifold, so for me to change that to V-Band and have it re-coated would be more expense than it's worth. Maybe I'm just bitter cause when I got my EFR, there was no V-band housing available. Well, both the 6258 and 6758 v-band housings only come in .85 a/r. I have the early weak 2.0 versus ABFX's forged 2.0 in the later NC's, so I will put in a 2.5 before I ever turbo in the first place. The stock 2.5's are built very well, so I don't really think I even need to build it. I really doubt I will have any spool problems with all that displacement, but what I am worried about is the power level before the transmission starts breaking. I intend for my car to be an HPDE/fast street car that has to be driven to events, so I want to be reliable above all. With the 2.5's extra displacement, then the 6258 should make 350 whp easy and I am pretty sure that is where it would need to stay for reliable track operations. Or I could just get the 6758 and run low boost on track, with high boost only for the streets? Mann:This is the 3rd trans in the car, 2nd NC2 trans. The first burnt a 5th gear at 300 torque, the second lost the shift forks or syncros after a track day, the current one is going strong so far. That guy already burnt multiple transmissions. Mann: Might be. Trying to decide now if I should throw in the carillo rods and cp pistons in 9:1, button it up with some h11 studs and shoot for 600+, or just do another stock motor and keep it at 15 psi for 50k miles and actually drive the car. Hard choice. So it seems like the logical way to do things would be to just throw in a stock 2.5 (adding ARP head studs, cams, and springs) and keep it mild boost for track days. So 6258 for instantospool and a hard upper limit of around 350 whp for street fun. I will actually drive the car a lot, like he is saying, so I think I have a plan.